The Msgr. 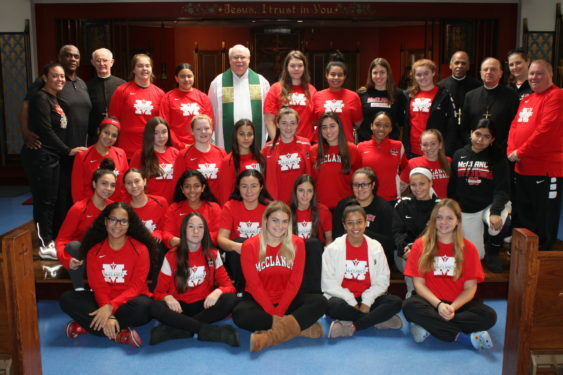 McClancy H.S., East Elmhurst, girls’ varsity and junior varsity basketball teams continued their tradition of attending Mass together on Nov. 11 at Corpus Christi Church, Woodside. This year marked the eighth year the teams have kicked off their season at Mass. Father Jim Hughes, parochial vicar, celebrated the liturgy and wished both teams the best of luck as their season gets underway. The Crusaders have adopted the motto “We>Me” for this season. Getting together for Mass fit in well with that theme. “We as a team come together to celebrate God and Mass and hopefully move through the season where everybody understands that it’s about us as a team and as a whole,” Hopkins said. The GCHSAA hoops season opened this past week with non-league games. The teams begin their competitive league schedule in December. The diocesan high school football, volleyball, soccer and cross-country seasons recently came to an end. Here’s a look at how the local teams fared. Three of the five diocesan teams advanced to this year’s playoffs. Christ the King H.S., Middle Village (‘AAA’), Xaverian H.S., Bay Ridge (‘AA’), and Nazareth H.S., East Flatbush (‘A’), all dropped first-round contests. In the junior varsity ‘AA’ division, St. Francis Prep, Fresh Meadows, defeated Kellenberg H.S., Uniondale, L.I., 28-14, for the league crown. Cristo Rey Brooklyn H.S., Flatbush, took home this year’s varsity ‘B’ division championship. St. Agnes H.S., College Point, won the junior varsity ‘B’ title. 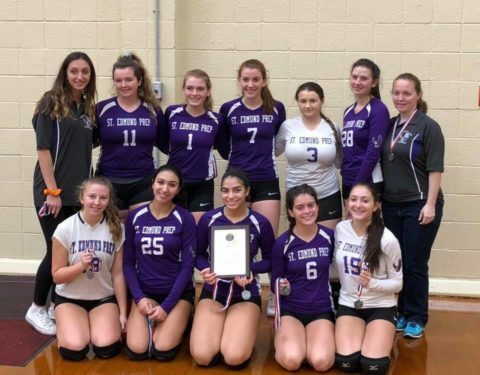 In the ‘A’ division, St. Edmund Prep H.S., Sheepshead Bay, pulled off a sweep of diocesan titles in junior varsity and varsity playoff action. The junior varsity team won its second straight championship, while the varsity team captured its fourth consecutive championship. The ‘AA’ division saw Xaverian win the junior varsity title and The Mary Louis Academy (TMLA), Jamaica Estates, emerge victorious for the varsity crown. Both Xaverian’s junior varsity and TMLA’s varsity teams went on to win their respective city championship matches. In Tier 1, Christ the King’s varsity team won the diocesan and city titles. In varsity Tier 2, Msgr. McClancy H.S., East Elmhurst, came away with the city crown. On the junior varsity level, Archbishop Molloy H.S., Briarwood, won the city championship. 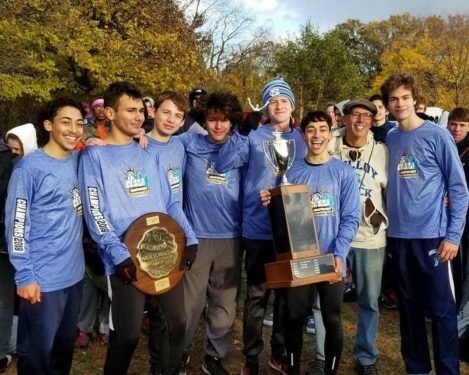 The St. Francis Prep junior varsity team won this year’s ‘AA’ diocesan and city championships. In the varsity ‘A’ playoffs, St. John’s Prep, Astoria, advanced to the final match of the city championship tournament. In the varsity ‘AA’ city tournament, St. Francis Prep reached the final match after being crowned this year’s Brooklyn-Queens champions. TMLA, which competes in the Long Island division of high school swimming, finished in third place at the diocesan championship meet, scoring the most points of any meet in school history. Head coach Ellen Ferguson was voted Coach of the Year, and the team won the Sportsmanship Award. Seven TMLA swimmers moved on to the state championships. The diocesan championships for Brooklyn and Queens take place in January and February. After winning the diocesan title, Archbishop Molloy won the boys’ varsity city championship for the first time since 1975. In the varsity ‘B’ boys’ division, McClancy took home the intersectional title. TMLA won the varsity girls’ cross-country diocesan title.